« Good ecology — a valuable fish! 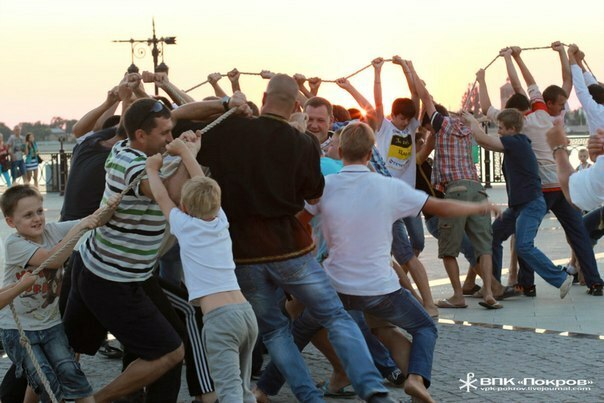 More recently, in the square of Peter I in the center of Astrakhan on Saturdays overcrowded. 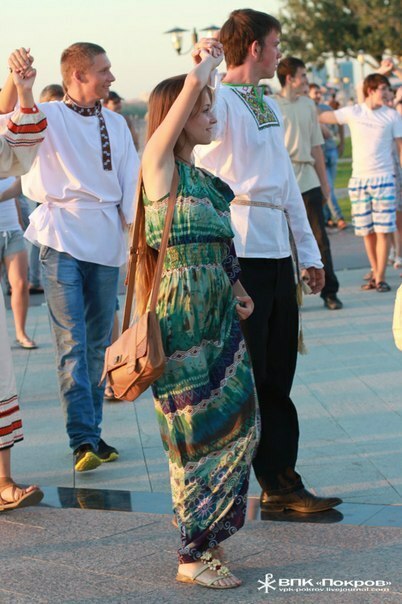 Bright sun dresses, embroidered blouses, dances, fist fights and tea from a samovar. Spend time having fun and interesting, but at the same time and get acquainted with ancient traditions evening can be anyone. The idea of an evening (from the word evening) is not new. 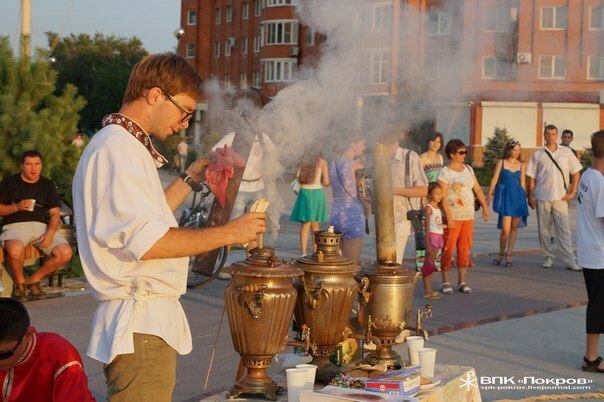 Vecherki in Russia were an integral part of the life of our ancestors. 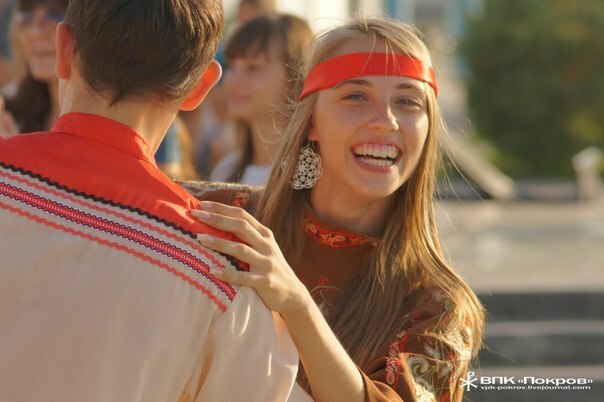 In the villages, young people gathered each evening — relax and have fun after a long day at work, having participated in the dances, games and songs. And on weekends and holidays to Vecherki gathered all the villagers. Until about 30 years of the last century, mostly young people and the rest. To revive the traditions of their ancestors come from members of one of the city's military-patriotic clubs. They worked the concept of the event, several times obkatali it and only then came out with an initiative to the masses. Who is going to Vecherki about 150 permanent members. And how many passers-by singing along, clapping and breaks into a dance — no one has yet considered. "Vecherki for our grandfathers and great-grandfathers were almost the only way to get to know, for others to see and be seen. Guys showed a valiant prowess, strength, wit, girls — beauty, become, the ability to move. At these gatherings were as pure youthful fun — Male pereplyas, fight wall to wall, and the maiden — dance, weaving wreaths and much more. But perhaps the most interesting — a collaborative game. Seemingly, "brook" as many years, and play it until now, but with some pleasure!. 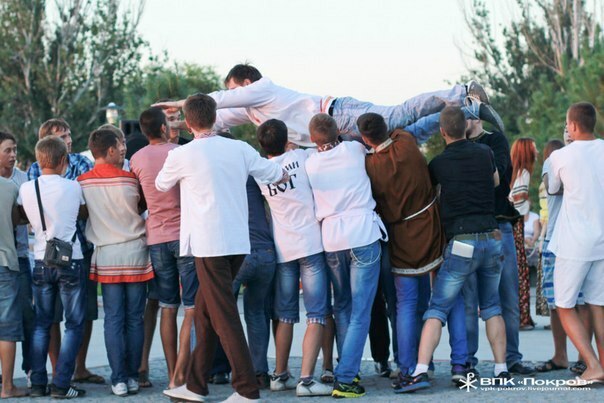 Egor Ugarit club leader "Cover"
Vecherki organization — not easy, but the members of the club handle. It keeps all the enthusiasm veils. Specially selected music, and learning to dance the dance-songs, the Internet and libraries organizers are looking for the rules of traditional Russian games. Announce an event with the help of the new group, "VKontakte" and a blog on the "Live Journal" (LJ). Fans of this pastime is growing. "In 2010, the club had five. We just played sports, promote healthy lifestyles, Orthodox values and culture. Now at the club more than 100 people, a lot of teenagers. Direction to express myself a lot. Someone" swings ", who -that folklore collecting, kayaking, combat training, creativity — are not sitting idle. 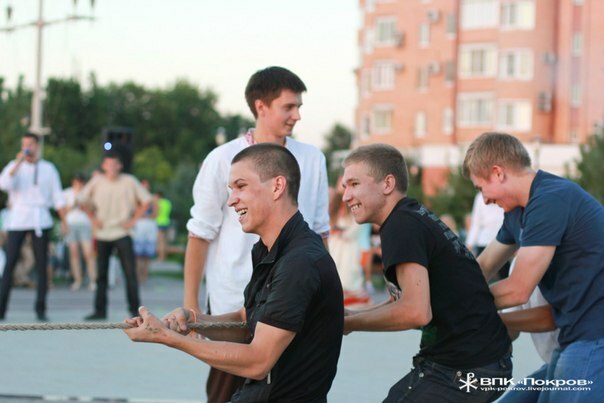 At rest in the evening the same spirit and we want as many young people have realized how great it is, fun, fun. " 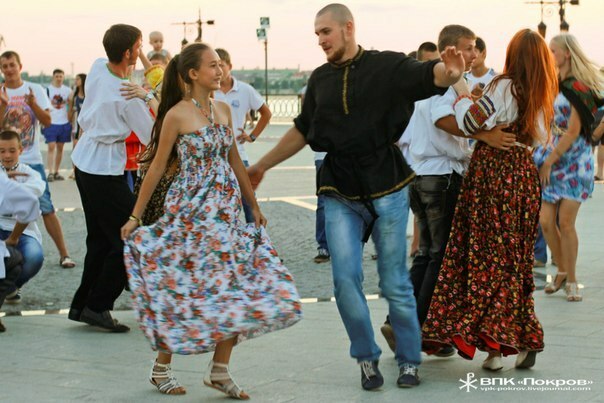 It should be noted that in the evening, many young people learn about their halves — that this way of dating is fast gaining popularity among the youth of Astrakhan. Even the Yegor found his sweetheart on the evening. "On getting married too early to say — I'm only 21 years old. But I know of cases that so many familiar. Incidentally, the next Vecherka August 10. Yet warm — will gather on the waterfront near the monument to Peter the Great. Colder — loop through the room. Just do not know what do we do when the people will be a lot. Each time the youth added. " "The first time I saw — could not believe my eyes. Jackals Young people do not come and dance. All are dressed, the girls — lovely sight. I often walk with his granddaughter on the site. We also participated. Lisa danced, she was presented with a wreath, happiness was — not describe. Only positive emotions. done guys. "